I simply cannot overstate the importance of your food choices when it comes to your mental health. In a very real sense, you have TWO brains – one in your head, and one in your gut – both of which are created from the same tissue during fetal development. In the big picture, nourishing your gut health is therefore essential to maintaining a positive mood. Even individual food choices may make a difference in how you feel mentally and emotionally from day to day. What you ingest first thing in the morning will determine how you feel for the rest of the day. Have you noticed how your body feels after a sugary, high-carb breakfast? Are you crashing before lunch time and/or starving a couple of hours after? Do you ever experience “brain fog” or difficulty retaining information or concentrating for an extended period of time? Do you find yourself experiencing mood swings and irritability or impatience after eating certain foods? That’s because the quality of foods we eat directly impacts our mental and emotional state, as well as our energetic levels. You’ve probably got a pretty full plate already trying to juggle all your personal and professional responsibilities and demands. I bet you’d be delighted if you could somehow figure out a way to generate tons more energy in your mornings while maintaining sharp focus AND stay on fat burning mode while you’re at it. If you’re like me, you need to be in top notch shape mentally to tackle the tasks and to-do lists required to make your vision come alive. This is especially true if you’re doing any sort of creative work like writing and researching or any kind of work that requires your sharpened intuitive capabilities. Up until recently, I struggled to get my mental engines revving in the morning. I’d wake up so tired from the night before; my energy levels felt stuck. I felt like I had cloudy brain fog that wouldn’t dissipate or let up. I tried going off coffee. Missed it. I tried going back on coffee. Felt jittery and crashed. I tried eating fruit only. I was starving an hour later and craving something starchy. Most grain foods… still are associated with a carbohydrate surge. They have a fairly high glycemic index, meaning that after 90-120 minutes, your blood sugar is going to go up, and that is detrimental to the brain… Even mild elevations in blood sugar compromise brain structure and lead to shrinkage of the brain . Every body is different. We’re all sensitive to and respond to different things. My intention here is to share with you what’s worked for me, yet it doesn’t necessarily mean it will work the same way for you. As with everything, feel it out and listen to your body. Change or tweak it according to what feels right for you – there’s no right or wrong way to go about it. – Cleansing/ detoxifying/ alkaline – it regulates your internal landscape, pH levels, and hydrates/refreshes you from the inside out. – Antioxidant – helps you fight disease and keep you looking young and hot. – Fat burner – boosts metabolism and help you burn fat and eat less. – Digestion helper – your gut and insides will thank you if you make this a daily morning ritual! These are only some of the overall benefits of each key component; there’s a whole lot more! If you want to know about the full spectrum of powerful healing effects of this Elixir, check out this post where I go even deeper and specify the mechanisms and breakdowns in detail. There’s a lot of controversy around coffee and whether it is “good” or “bad.” Science seems to support both sides. For example, in one of his articles, functional medicine doctor Mark Hyman refers to coffee disrupting our adrenal glands and spiking up our stress hormones. . I gave up coffee for a long while because I felt jittery and then I’d feel the subsequent crash thereafter. I just didn’t like how it made me feel. So I went for the cup of tea in the mornings. Then my boyfriend introduced me to Bulletproof coffee and schooled me on some interesting things that made me want to give BPC a try, especially because he really makes a great tasting cuppa. The next thing I noticed was that I didn’t experience that jittery caffeine rush and subsequent crash like I had with my past morning lattes. That’s because mixing caffeine with a milk (cow, soy, or nut milk) can spike up your blood sugar. Most milks of any kind contain some amount of sugar. With BPC, the high grade fats in the coffee made me feel balanced and satiated for a long while after drinking it. I found I didn’t need to have that piece of toast anymore. I noticed I stopped craving carby things like croissants and english muffins. The other thing I noticed was my ability to focus for a sustained period of time. This was a big one for me. It felt like I could just dive into my work and sustain the flow for hours after ingesting BPC in the morning. – Dave Asprey, creator of Bulletproof Coffee and founder of Bulletproof Executive. You know who else starts the day with BCP? Dr. Mark Hyman. Yes, he did write an article with reasons to quit coffee, AND it appears that he might also believe that coffee taken in this form (with the good kinds of fats) can be a good thing. People always want to know what I’m eating. I talk a lot about cutting sugar and processed carbs and eating real, whole, fresh foods, but everyone wants to know if I walk the walk! The truth is that I have to. I have about ten jobs, two kids, a dog, a team, weeks of travel at a time… the list goes on and on. In order to keep up with this lifestyle, maintaining optimal health becomes a top priority. 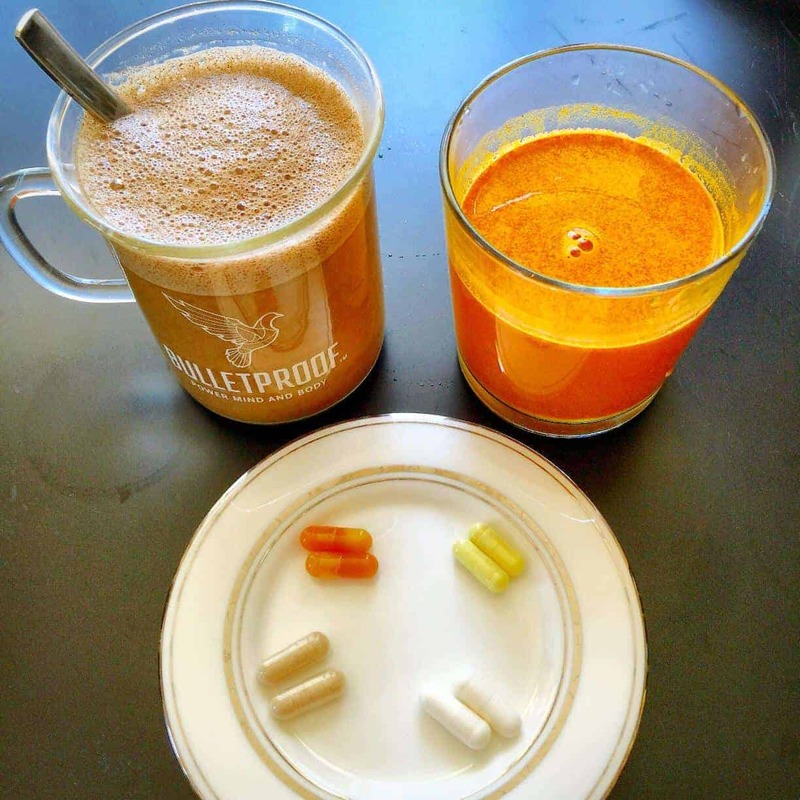 Here’s a typical day of eating for me… Breakfast: Bulletproof Coffee. When I can, I’ll also make some time for movement in the morning. I love to go on long bike rides with my son or start up a game of basketball before a long day, and after I work out, I usually enjoy my whole-food protein shake. Take Vitamin A (i.e. : cod liver oil) along with Vitamin D to avoid overdosing. The general recommended dose is 1000 IU / 25 lbs of body weight. It is extremely important you get your bloodwork done to know exactly where your body chemistry stands. Even living in Miami, I was surprised when the doctor told me my blood work showed my Vitamin D levels were on the floor they were so low. Before you take this or any supplement, please do your research and consult with your doctor, especially if you’re taking other medications and/or have other health conditions. Again, this is what I take because it works for me. Every body is different. I take Solaray brand, 2000 mg/day in the morning. Both prominent biohackers, Dave Asprey and Tim Ferriss have mentioned use of Ciltep when they need a brain boost for writing or other creative purposes. Comprised of artichoke extract among other all-natural ingredients. *Even though I share the amounts/doses I take daily, please check in with your doctor or do your own research. I am not a doctor nor am I recommending you follow my doses. Although I am taking these supplements now, there’s a myriad of supplements one can take. This is not meant to be the ‘end all, be all,’ or the ‘holy grail,’ as I myself change up what I take depending on various factors. So there you have it – my daily morning trifecta breakdown. Now you’ll understand why I’m so inspired to share all this research and knowledge with you… Not so you’ll blindly follow it, but so you educate yourself and then make a balanced decision based on what works best for you. I didn’t figure all this out in one go. I’ve been tweaking and reinventing for a while based on how I feel and what my mind and body most need to get the job done at any given time. You’re here to do and create cool things that will provide value to us all. You owe it to yourself to set yourself up to win and create the most optimal environment for your mind and potential to bloom. And if I’ve even created just one little ripple in your pond today with this info, I am very grateful for the opportunity! Let me know how you go. I’d love to hear your thoughts after reading this and also what kinds of powerful morning rituals you create for yourself too.